I promise I didn't forget about the Welcome to my Crib segment! I just got a little distracted sharing other things with you all! Today I'm highlighting my living room. When I moved into my townhouse back in September I knew that I wanted the living area to be very cozy. I also knew that I needed a large couch considering the ceiling is so high in the room. After searching high and low I found this couch with coordinating chairs and pulled together the accessories from here and there. I think the room turned out great! It's a nice place to watch TV or a movie, chat, or have a glass of wine. I'm considering getting a new coffee table and side tables, however, these belonged to my mamaw, and I just don't know if I can part with them yet...Enjoy looking around my living room! 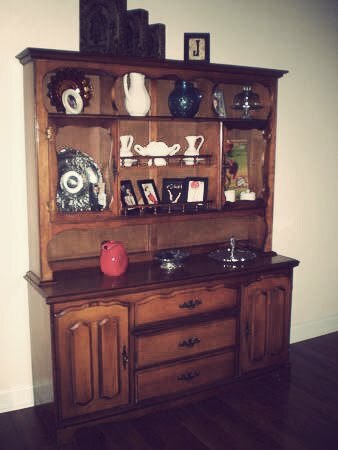 This is my mamaw's antique hutch. I don't even want to guess how old this piece is. My mamaw passed away a few years ago, so to have this in my house is really special. I found these adorable 'Vogue' greeting cards several years ago and decided to display them in these solid black frames. 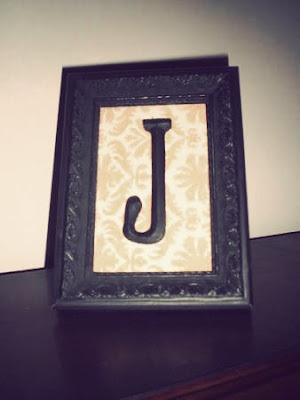 I ordered this initial frame from my sweet lady Hilary. She makes the most darling frames! If you ever need a gift, contact her! I love to mix and match old and new pieces. As I mentioned, the coffee table and side tables belonged to my mamaw too. See little Millie? That's her favorite spot to chew her bone. When I found these pictures I knew I had to have them for my living room. Wanna know the best part? They were only $40 a piece at Ross!! This is my mantle right now. I want to find a couple new pieces to add but haven't found the perfect ones yet. For now, this will do. Hope you enjoyed today's tour! You're welcome to come over anytime! The last tour will be the master bedroom and bathroom. I hope you all have a happy Monday! I think you need a bold, over the top, custom made (or found) flower arrangements for the left hand side of your mantle! Something with a little height! Or, you could do a tall flower arrangement on the top of the mantle to the left- move the candle sticks to the right side. Have you ever thought about painting that one wall? 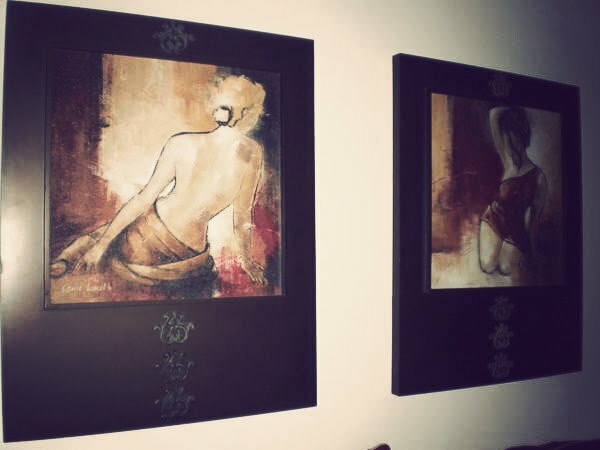 I think that will add some depth and dimension to your room! Just some ideas....even though I'm sure you weren't looking for any! And now that I have rambled on to make this the worlds longest comment...I'll zip it now! What a great, large room, with so much space! Love that hutch! Anything that's a special gift means that much more, you know? Aly, I love your ideas!! I have thought about painting that wall many times, I think that would make a world of difference! I am open to ideas all the time :) You are a sweetheart, thank you! Your furniture is gorgeous & oh-so you! i LOVE the prints you got at Ross, they are BIG and make quite the statement! i love that you have pieces from your grandma!! they are definitely special! love the round throw pillow too!! been looking for some myself! If you're wanting to add height to your mantle you could also add a tall mirror and prop it on the mantle. (Not sure if that makes sense but I'm sure you have seen this somewhere.) It also adds depth to the room because it gives a reflection. You can find some great mirrors at TJ Maxx & Ross for $30-$40! Love what you've done with the place though! You're so classy! I love your chairs lady. You made a fabulously cozy space! man, i'm so jealous of your hardwood floors right now! 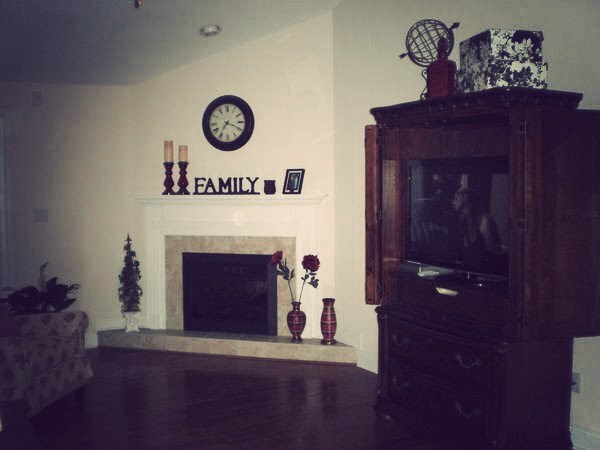 your living room is adorable! you've done a fantastic job! 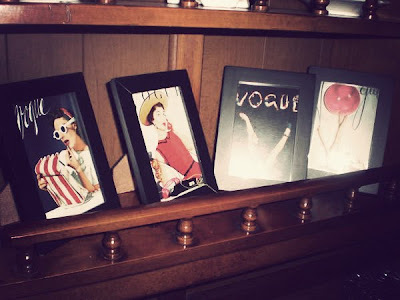 I love your living room furniture and those cute vogue cards. I have pieces from my grandma’s house, too, and I just cannot part with them. I agree with the people above. 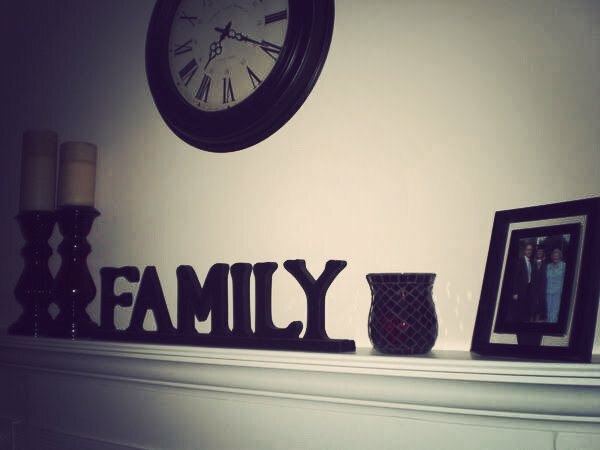 You need to add little more drama to your mantle. I love the idea of painting the wall, but if you are renting, that might be too much of a hassle. Maybe put a mirror [like someone else suggested] or a great painting or piece of art. Anyway, can’t wait for your next crib post! Everything looks so great! How cute! I love sentimental pieces too :) We have a few in our house that I just love! LOVE it, can i come live with you. 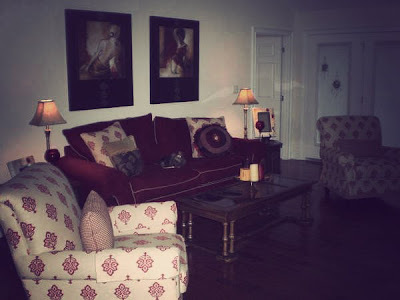 your living room is just as adorable as i knew it would be!!! i need to remember to take pics so i can play along, too!!! love this fab idea, jules! Your living room is adorable! I love the armchairs...and how special that you have your grandmother's hutch! julie! i love peeking inside your house! show us more! Such a pretty room! I love what you did with it! Your TV cupboard is to die for!!!! I love it!